Before Elizabeth David died in 1992 she and her editor, Jill Norman, had begun work on a volume of "The Best of" but then her health deteriorated and the project was shelved. The idea was revived in 1996 when chefs and writers and Elizabeth's many friends, were invited to select their favourite articles and recipes. Some sent notes explaining their choice, others provided an anecdote or a recollection about her, others sent lists of recipes they had been using for years. This book is the fruit of that harvest of recommendations and the names of the contributors, who number among them some of our finest food writers such as Simon Hopkinson, Alice Waters, Sally Clarke, Richard Olney, Paul Levy and Anne Willan, appear after the pieces they had chosen along with their notes. 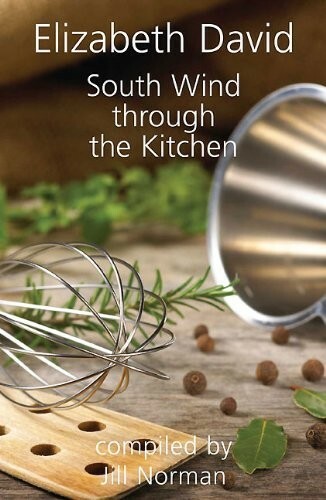 The extracts and recipes which make up "South Wind Through the Kitchen" are drawn from all Elizabeth David's books, namely "A Book of Mediterranean Food", "French Country Cooking", "Italian Food", "Sumer Cooking", "French Provincial Cooking", "Spices, Salt and Aromatics in the English Kitchen", "English Bread and Yeast Cookery", "An Omelette and a Glass of Wine", and "Harvest of the Cold Months". There are over 200 recipes in the book organised around courses and ingredients such as eggs and cheese, fish and shellfish, meat, poultry and game, vegetables, pasta, pulses and grains, sauces, sweet dishes and cakes, preserves, and bread, all interspersed with extracts and articles making it a delightful compendium to dip into as well as cook from.